In the eyes of many, the Kindle Fire didn’t have much of a chance of competing with Apple’s technically superior iPad tablet. That remains to be seen in the longer term, of course, but for now it’s all just speculation. Regardless, this shifts the focus of people watching for active competition to the Kindle vs Nook battle. They have been ongoing rivals in the eReader world, of course, and now they both offer budget priced tablets that will do a lot more than help you read. On paper the Nook Tablet is quite possibly the better device. It has the same processing power, more RAM, and most importantly twice the local storage of the Kindle Fire. This last alone was enough to get many people to declare it a clear winner before either device hit shelves. Now that we can use them both side by side, the situation has drastically changed. 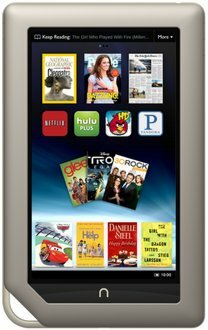 The Nook Tablet, despite having 16GB of storage space (~12GB available to users), severely restricts what users are able to do with that space. To such a degree that the idea of purchasing the device as a video player without the intention of rooting it is fairly laughable. Users will find that Barnes & Noble has chosen to allow a mere 1GB of storage for the loading of outside content. While the remainder can be filled by anything B&N sells, the fact of the matter is that right now they don’t offer nearly enough content to justify the choice. There is not, for example, a video store for the Nook Tablet. Neither is there an MP3 service. You can, of course, access services like Netflix or Pandora for all your media consumption needs, but should you desire to watch or listen to things that you yourself own already then chances are good there is a problem. Basically the only thing available in any quantity besides apps, and the scarcity of Nook apps is another complaint to address at another time, is reading material. It simply does not justify this. While I think that anybody would agree that the Kindle Fire‘s 8GB on-board storage is one of its weak points, Amazon at least manages to expand your options. Sure you might have trouble loading everything that you want onto the device at once, but you can always stream it or store in their provided cloud storage until it is needed. This is in addition to also offering equally functional access to Netflix, Pandora, and basically everything else that the Nook Tablet is using to make up for its lack of media store integration. What probably should have been a clear win for B&N has turned their device into a joke for many prospective buyers. We can hope that as time goes on this will be changed via a software update of some sort since the Nook Tablet is honestly a decent piece of hardware for just $250. It is ridiculous that to get any decent amount of storage space a new user should feel compelled to purchase a memory card when the drive is just sitting there more than half empty. It’s no real secret that Barnes & Noble has quickly come to depend on their Nook eReader line, which by extension means it isn’t really too surprising that they might overreact when that is threatened. A recent spat with DC Comics over a limited term of Kindle Fire eComic distribution exclusivity for a segment of the publisher’s current titles has resulted in just such an overreaction, though, and their failure to see the mistake may well provide difficulties going forward. The underlying complaint on the part of Barnes & Noble is that DC has had the audacity to offer eReader exclusivity on 100 or so titles to Amazon as a temporary means for Amazon to promote the Kindle Fire. While there is no information yet, to the best of my knowledge, as to how long this deal will remain in place, both DC and Amazon have acknowledged that it is not intended to necessarily be a long term arrangement. On the surface, one has to applaud the effort. Maybe this was an instance of Amazon throwing their weight around that required a significant response from a major retailer to help publishers see that such behavior is unacceptable. That sentiment lasts right up until the realization that at this time Barnes & Noble does not in any way offer electronic comic publications. The chain has decided that they are so dedicated to the principal on this issue that they are willing to turn away customers at the door rather than allow Amazon’s Kindle Fire access to something the Nook Color has not even tried to exploit after a year on the market. Now not only with B&N customers not be able to download their comics, they can’t get physical copies except through the B&N website. Stores have even been instructed to turn away special orders. No copy will be allowed to enter the store, no matter how much you want to give your money to Barnes & Noble. In the end, I see this hurting nobody but B&N, their customers, and the creators of the works in question. Nobody wins but Amazon and customers have one more reason to avoid dealing with anybody else. While this could have been quickly remedied with a quiet apology for initial overreaction, there is no excuse for letting it continue and treating customers this poorly, especially at a time when they are faced with a superior competing product. With the Kindle Fire making such an impression on the Tablet PC marketplace, Barnes & Noble has been placed in a tough spot. They are quickly coming to rely on their Nook product line and such a thorough triumph over their popular Nook Color would certainly be a tough blow to take. They had to either put out something big or be left behind. Fortunately, they’ve managed to come up with an answer. Sounds a lot like the Kindle Fire, even if it looks identical to the existing Nook Color. It might be 25% more expensive, but for that money you get a device that’s lighter, faster, and holds more. Sounds great, right? The differences are not extreme. You save about half an ounce in terms of weight, 6GB of usable internal storage space, and a bit more RAM. Even the advertised battery life is just slightly better, offering perhaps 90 minutes more video playback time under ideal circumstances. What Amazon has been pushing, however, is the media. Barnes & Noble has not been able to offer comparable content so far for their Nook Color’s App Store, so it was important that they be able to bring something to the table here. Bundling with Hulu and Netflix will go a long way toward making up for the lack of an integrated video store, of course. That was the whole point of pushing them, despite the fact that they will also be available for the Kindle. The bookstore is obviously pretty good already, and they’ve been at the color eBooks game a bit longer than Amazon so hopefully they have a good grasp on things there. Even music is covered thanks to Pandora and other similar services. Perhaps the most surprising thing is the idea of Nook Cloud Storage. We don’t have many details on that yet, but it accomplishes another aspect of the Amazon comparison in a vague fashion. Chances are good that this will not be available for anything besides content purchased through B&N, but that is just speculation so far. Barnes & Noble is claiming to have a screen superior to that on the Kindle Fire. It is honestly hard to assess right now since they’re somewhat invested in the comparison. It might be advisable to reserve judgement on that point until a side by side comparison can be arranged. They are also making a big deal out of their new Nook Comics line. This could explain a great deal of why they got so dramatically and publicly upset over DC Comics forming an exclusive deal of any sort with Amazon in preparation for the Kindle Fire launch. B&N is now boasting the largest collection of digital Marvel comics brought together so far for a single device. It’s an accomplishment, though there is no notice of exclusivity and therefore no reason to believe this will be a major factor moving forward. Probably drawing on the same sort of technology that allows for those comics, though, is a new Nook Book category called PagePerfect. Going off of what information is currently around, this is less an imitation of the new Kindle Format 8 and more a proprietary PDF imitation. Static formatting, zooming, scrolling, etc. The only obvious difference is that Adobe isn’t involved. Now that we have a couple of competing budget media tablets to choose from, which is worth the money? It depends on your needs. The Nook Color, and by extension the new Nook Tablet since it is just a more powerful version of the same, is primarily an eReader. Barnes & Noble has done a fairly good job of shoring up their shortcomings by bringing in excellent integration with other content providers, there is no substitute for direct support and every reason to believe that those same providers will be serving up media to Kindle Fire customers as well. The price is a bit off-putting, now that we’re talking about tablets cheap enough for $50 to make a big difference, but you do admittedly get more power for the price. While claims about the screen quality remain unproven, the extra RAM will make a difference and additional on-board storage will be a big deal for some. As usual, which device you go for will depend on your needs as a consumer. At this point it seems that Amazon is offering a clearly superior library of media to choose from, especially if you take all types of media together. They’ve also done a great job, by most preliminary accounts, of customizing and streamlining their Android Fork to make the Kindle Fire both look unique and perform more impressively than its specs might indicate. On the other hand, Barnes & Noble is offering what is arguably the better dollar to power ratio. This will be most important for people wanting to root the device and just exploit its most basic hardware capabilities. That might be a smaller percentage of the intended user base, but it is worth addressing. The Nook Tablet also comes closer to offering a stock Android experience, for those who are concerned about potential privacy concerns related to Amazon’s Silk browser and other cloud based services. They are also more focused on building up the color eReader market, and you can count on Barnes & Noble to maintain the eBook as their primary concern for the indefinite future. The choice will be up to you and the distinctions are honestly fairly slight right now. What is most important is that the Kindle Fire might have some valid competition after all. Competition always leads to improvement. Just look at how far the Nook Tablet is beyond the Nook Color. Nook Color vs Kindle: Does B&N Still Have A Shot? The Nook Color was not the first color eReader by any stretch of the imagination, for all it beat out the Kindles to that point. Even if you exclude all of the PDAs, Blackberrys, and smartphone types of devices in general that gave the Microsoft LIT format a space to thrive in, there were others that came before. Credit where credit is due, however, B&N created the first reading tablet that was worth owning. Its value might just not come as much from the pure quality of reading experience as it could need to to remain competitive as an eReader. Analysts have regularly indicated that the appeal of the Nook Color, for the average consumer, is in its ability to access magazines and casual games along the lines of the ever popular Angry Birds series. The portability, full color display, and Android based operating system make it great for short periods of interaction and immersion, even if the screen is less than ideal for extended reading. 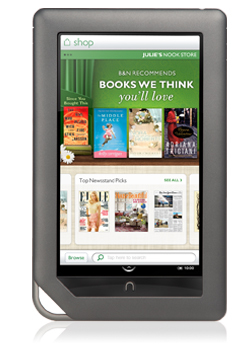 Now, with the release of the Kindle Fire, there is reason for Barnes & Noble to be concerned over their device’s future. What it comes down to is a practically point by point feature trumping on Amazon’s part, plus a superior media distribution base to draw on in the areas where a tablet is most useful. The points of comparison stand out a little bit when you consider the Nook Color’s superiorities over the Kindle 3 (Kindle Keyboard). That comparison is based on what features Barnes & Noble has chosen thus far to highlight on the device specs section of the Nook Color sales page, in an effort to present things fairly. I’m ignoring the majority of software concerns, especially in terms of file type compatibility, since apps are theoretically able to make up for most any deficiency. These would still, however, favor the new Kindle. While the Nook Color is the only one of these with an expandable memory slot, which would seem incredibly useful to many users, this has proven a mixed blessing for the company since it provides people with a simple and effective way to bypass the Nook’s proprietary Android build. Basically it appears that with the Kindle Fire Amazon has looked at what the competition was doing and improved on it. No surprise, that’s what competing products are supposed to do. They’ve essentially got a slightly smaller, slightly lighter 7″ tablet that they’re not hooked on the idea of presenting as an eReader. Overall the technology behind the Kindle Fire is newer and more powerful in every way that matters and still comes in at a lower price for the end user. The only real question now is what B&N does with this information. We can take as a given that Barnes & Noble is not in a position to provide the same sort of robust media library that Amazon is bringing to customers. Even if they were to start pulling in video streaming deals and other things along those lines to fill in the gaps, the time factor would be a problem. What they can do is work to get Netflix, Hulu, or any number of other streaming services on-board as partners. With Amazon poised to make a move into that market in a larger way than they have so far, it shouldn’t be too difficult. It would mean giving up on potential media sales revenue, but it also eliminates the need to build up the infrastructure to support that media. We know that rooted Nook Colors are able to access services like Netflix already, so it would only make sense to cash in on it given how easily root-able these devices have proven to be. There is also the rumor of a new Nook Color that will bring hardware upgrades. Now, this is pretty flimsy in spite of having seen posts declaring it would be released “any day now” since early September, but it could make a big difference to their presence in the device market. While a price drop in the current Nook Color is a given, having a newer more powerful model available would work well whether it was a more expensive option or as an outright replacement. In the former scenario it would highlight the fact of the low price point while providing options. In the latter, there is room to hope that in some way the Kindle Fire will be inferior. If the hardware option is going to make a difference, however, it needs to happen soon. Once people start getting their hands on the Kindle Fire, barring major issues with them, the momentum is likely to increase leading into the holiday season. What we do know is that the Nook line as a whole is pretty much the only part of Barnes & Noble that is growing right now. They need to keep things going. As a result, you can be sure that something is on the horizon to keep the situation competitive. Tablet PCs just tend to be the most useful when it comes to things that aren’t reading, so it might take a bit of a shift for B&N to really make their presence known now that there are comparably priced options available. Whether or not they manage remains to be seen, but hopes are high. While the Nook Color has not been my favorite device personally, it did provide us with one of the first reasonably priced yet fully functional tablets almost by mistake (rooting is essential in a way that many are hoping will not be the case with the Kindle Fire). It would be a shame to seem them fall aside now. Beginning just days before the press conference that revealed the Kindle Fire to the world, rumors started popping up that Barnes & Noble was nervously prepping their next tablet for a hurried launch to avoid getting shut out of the market. Naturally they haven’t confirmed these rumors to any degree so far, but the latest reports indicate the potential for both a cheaper Nook Color hardware update and a larger, more powerful incarnation of the same at around $350. For the past couple months, it’s been pretty great to be Barnes & Noble. They’ve been selling one of the most functional affordable tablets on the market, almost by accident. They’ve had what was honestly the best eReader in the US market in terms of performance and readability. On top of this, Amazon spent months seeming to ignore the world of eReading hardware aside from vague hints. It couldn’t last forever, but they got to make a big splash with no significant recently released competition. 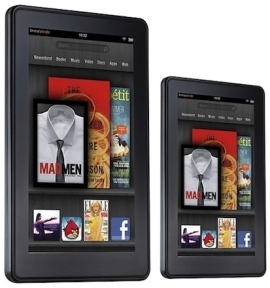 At first glance Amazon has now got a huge advantage again, especially in terms of the Kindle Fire. While the Nook Color brought a lot of function for comparatively little money, its main value has generally been in how easily rooted it is. Barnes & Noble has added an internal app store that has gotten quite a bit better over time, but they have nothing quite as robust as the Amazon Android App Store nor do they have the ability to offer the same kind of end to end experience that the Kindle Fire is anticipated to provide. Simply put, the emphasis on the Nook Color as specifically a color eReader might have backfired. Since B&N is experiencing a great deal of its current success (what there is of it) from the Nook line, they cannot afford to not respond. Fortunately, from the sound of things, there were plans in place. 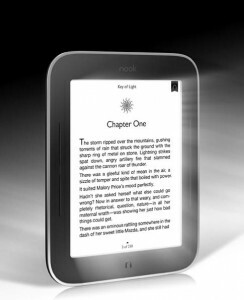 The Nook Simple Touch eReader shouldn’t have any real problems just now. It might be slightly more expensive than the cheapest of the Kindle Touch models coming up, but the technology is comparable and for now we have to assume that the experience will be generally similar. What they’re worried about is the Tablet competition. A new, larger, more powerful Nook Color, assuming rumors hold some basis in reality, will be either announced or released before the end of October at around $350. This, along with a hardware update to the existing Nook Color, would theoretically have a chance of bringing them back to the front of consumer perception again in time for the 2011 holiday season. Admittedly we’re talking about theoretical hardware at the moment, so as with most of the Kindle Tablet speculation it has to be taken with a grain of salt. Still, if they can bring hardware and content availability anywhere near to in line with what Amazon is offering with the Kindle Fire it would be great. Just the announcement of a $200 tablet from Amazon has already changed hardware prices in the market significantly. Real, effective competition among budget tablet providers can only be a good thing. There has been a lot of speculation going around about the possibilities for the next generation of the Kindle competitive Nook eReader. Barnes & Noble(NYSE:BKS) announced quite recently that on May 24th 2011 we will be hearing all about their new eReading device. Other than that, there’s little to go on so far. 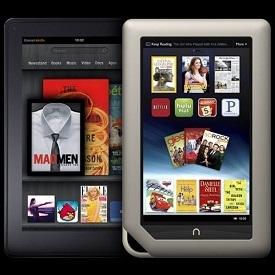 The Kindle vs Nook competition has been an ongoing factor in the advancement of the eReading industry as a whole. Amazon finds a way to extend the Kindle’s battery life, and B&N follows suit. B&N brings a couple games to their eReader and now you can find bunches of even better ones in the Kindle Store. It’s all about one-upsmanship. Though there were obviously other factors involved this was a major force in driving eReader prices below the $150 in the first place. It has only ever worked out to the benefit of the consumer. These days, B&N has been concentrating on the Nook Color for a while now and as a result is pretty much out of the game. The Nook Color is an amazing mini-tablet and can be a lot of fun. It even has some definite advantages over the Kindle for particular uses. It does not push things very well in a one on one feature comparison, however. I’m hoping that this announcement addresses that with the first major update to the monochrome Nook’s hardware. At the moment the Kindle is significantly lighter, easier to read on, faster, and has far better battery life. The comparison definitely stands a bit one sided at the moment. That said, it is hard to imagine where there is room for enough improvement to put a Nook product back on top. The shortcomings of the Kindle, such as they are, have more to do with the software end than the hardware these days. It is more likely that we’ll be seeing an update to the Nook Color. The most recent software update for that device has made it capable of taking on the iPad in a limited sort of way, opening it up to a large variety of apps and drastically improved functionality. The whole Nook Color endeavor has been such a success for B&N that it seems difficult to imagine that they won’t seize the chance to capitalize on the success with a boost to the somewhat underpowered hardware. There is a lot of money to be made in digital content beyond the eBook and with Amazon seemingly poised to drop their own Tablet PC by the end of the year, now is the time for Barnes & Noble to get the jump on a serious entry into the marketplace. Who knows, we might even end up getting the first color eReader with an E Ink screen from them? Even without that, if they can keep the price down enough it will be a big hit. Recent news regarding the Nook Color‘s new features should go a long way toward illustrating the direction that the mini-tablet is likely to take in the near future. While many have never viewed it as serious eReader competition for the Kindle, this seemed to be the hope that Barnes & Noble(NYSE:BKS) had for the device. It seems they’re coming to their senses a bit and realizing the real potential of their affordably priced tablet. To sum the situation up a bit, a recent offering on the Home Shopping Network let slip certain information about upcoming features for the Nook. Most notably, it will be the first tablet on the market to include Flash support. In addition to this, there will finally be support for email, as well as an app store to expand the capabilities of the device. It seems that a viewer managed to capture the segment and post it on YouTube, which then prompted Barnes & Noble to issue a press release confirming the email, though not yet the Flash. This definitely seems like a divergence from the previously staunch position that the Nook Color must be seen as a reading device first and foremost. It makes a lot of sense. Users seem largely to value the newest Nook incarnation for either its tablet capabilities or its color screen rather than any percieved inherently superior reading performance. Really, while I’m not a fan of it as an eReader, this should make Barnes & Noble into a major player in the tablet competition. The press release also emphasizes the importance of the Nook platform’s magazine and children’s book offerings. Since these are the areas where the color screen really shines, given the shortcomings of a monochrome display for such applications, it definitely makes sense to see the focus turn this way. I think there’s a lot of future in the marketing of children’s books in particular, things along the lines of NOOK Kids, for the less expensive and versatile tablets on the market today even if they fall short in other areas. Great for actually getting in the hands of kids. The effect of these upcoming changes on the Kindle in the end seems destined to be fairly negligible. There’s a good chance that this will end the direct Kindle vs Nook Color comparisons for many, since it indicates an emphasis on non-book aspects of reading as well as non-reading applications. That’s something. Really, though, it feels like this is more an indication of how successful the Kindle has been than anything else. The rush to a color eReader hasn’t succeeded because it meant a number of compromises that Amazon didn’t make, so they’re moving into a slightly different field. It could also be that this is meant as a means to get a jump on Amazon in light of the rumors that have been going around about a potential Kindle-related line of tablet PCs. The software update is supposed to drop in April, by all accounts, so be on the lookout for it. I believe that this will breathe new life into the Nook Color for existing users as well as bring in a large new audience.